One of the U.S. Air Force's most important fighter bombers, the F-105 Thunderchief was in operation for almost thirty years. It played a key role in the Vietnam War. 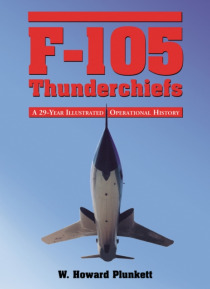 This book details the histories of the 103 F-105s that are displayed around the world. Part One of the work summarizes the 29 years of F-105 operations, focusing on events, aircraft configurations, units and bases. The individual h… istories and photographs of each surviving F-105 from its production to its static display are contained in Part Two. Appendices provide a mapped-out, state by state "e;Thunderchief Tour,"e; and the fate, by serial number, of all 117 of the F-105s that survived their operational career only to end up in scrap yards.